After an entire evening huddled together in Hillary’s kitchen, (we would not file this meal under “quick & easy”) it’s safe to say we’ve sealed a years worth of good fortune after the New Years feast we put together. Our menu: dumplings for prosperity, noodles for longevity and scallion pancakes because well, they’re just so darn good. They’re also Amy’s favorite thing on a dim sum menu and therefor had to give them a try. It was quite the process (but so worth it!) so grab a bottle of wine, a sous chef (aka friend) and settle in. Many people hate to drag out the food processor due to the hassle of, I don’t know…washing it? When in reality a food processor can be a HUGE time saver in the kitchen and honestly takes no longer than 30 seconds to wash out. We highly recommend using it more if you should want to cut prep time in half. Anyhow – make sure mushrooms are free of dirt and place in bowl of food processor along with the two cloves of garlic. Pulse until mushrooms are at a small dice. Be sure not to take too far or mushrooms with break down into a gummy mess. In a saute pan cook mushrooms and garlic in oil and sesame oil. Add scallions, S&P, soy and oyster sauce to taste. Cook until the liquid has re-absorbed into the mushrooms. Now you’ve got your filling! Once cooled a bit add in one egg as a binder. Whisk together an egg wash – 1 egg mixed with a dash of water. 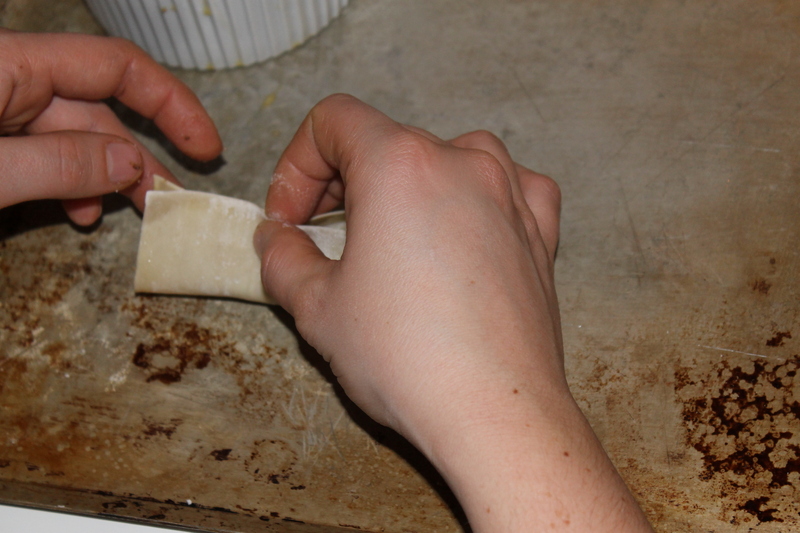 Brush the outside edges of a wonton wrapper with the egg wash, place a spoonful of the filling inside and fold over to seal. Brush just a bit more eggwash along the top and create a row of accordion folds. To cook them, pour about a half inch of water in a non stick pan and bring to a boil. 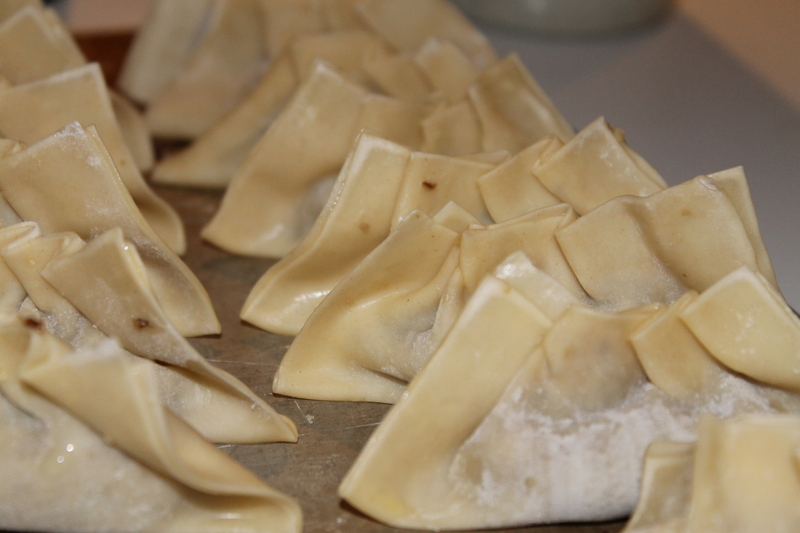 Arrange the dumplings in an even layer and cover. 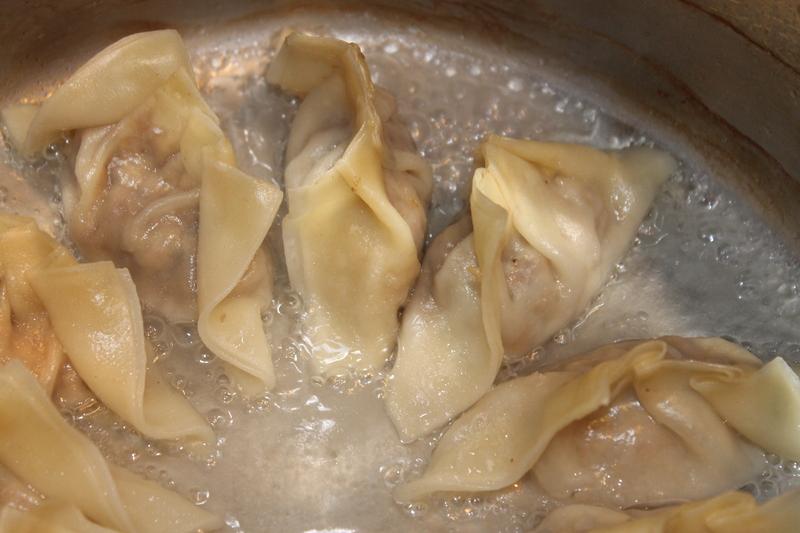 They will cook in just a few minutes — take them out when the wontons are soft and slightly translucent. Heat a couple of tablespoons of peanut oil in a large pan. Add the pork and saute until it is cooked, seasoning with s+p. Add the garlic and the cabbage and saute until it is wilted and tender, season with salt. 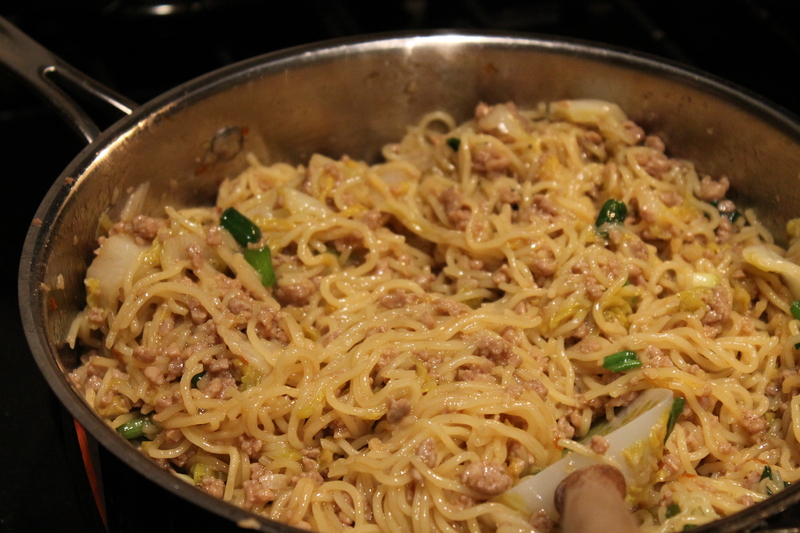 Add the noodles and stir to incorporate. Pour in a healthy amount of hoisin sauce — we also added red pepper flakes, some spicy sesame oil and oyster sauce — taste the sauces and seasonings until it is to your liking! Sprinkle in the scallions a couple of minutes before you take the noodles off the heat. The layers of flavor from pork, a nice crunch from napa cabbage and all those luscious udon noodles made complete with a smorgas of sauces was a delicious experience! Lightly fried in vegetable oil, these doughy bundles are incredibly flavorful. Place yeast, water and sugar in small bowl to activate yeast. Sift flour into 2 equal portions into separate bowls. 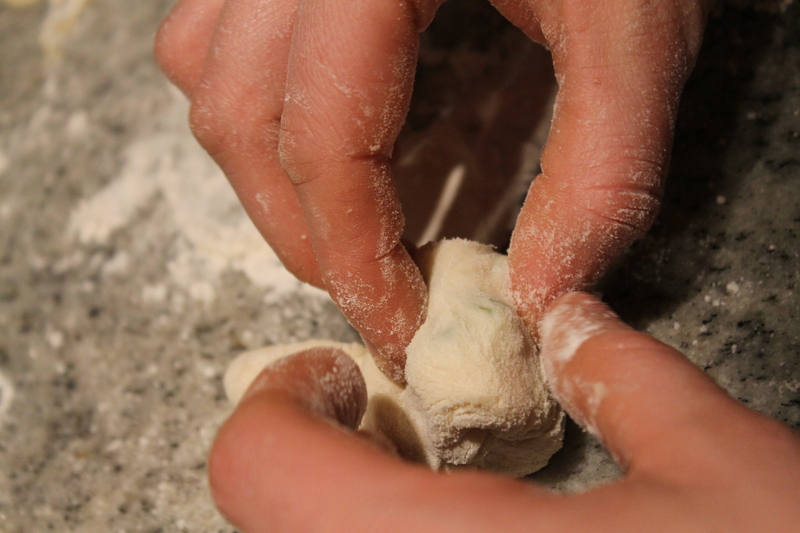 In the first bowl, slowly add the yeast-water, mixing with a spoon until a dough forms. In the second bowl, sprinkle 1 t of the salt into the flour. Slowly pour in 1/2 cup of the boiling hot water while vigorously stirring. Add more water and keep stirring until a rough dough forms. 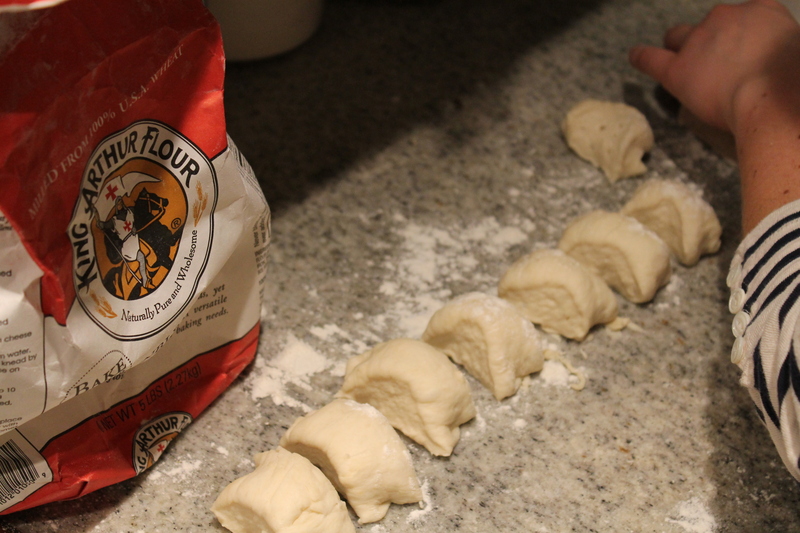 (If you accidentally add too much water and the dough is too soft, add a little more flour.) 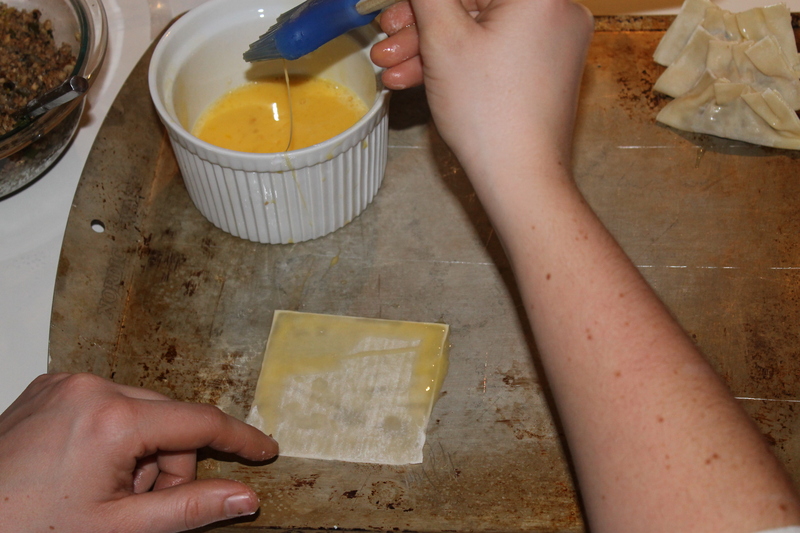 Mix in 2 tablespoons vegetable oil. Roll the doughs out on a floured surface and knead them together (this is a very sticky dough, be sure to have lots of flour at the ready). Cover with a damp towel and let rise for about 40 minutes. Once you’ve let the dough rise take it out and roll into a log about 2″ wide. Taking a dough cutter or knife portion the log into small segments. Roll into small circles about 4″ wide. Brush with a little vegetable oil and place a good sprinkle of scallion on top. 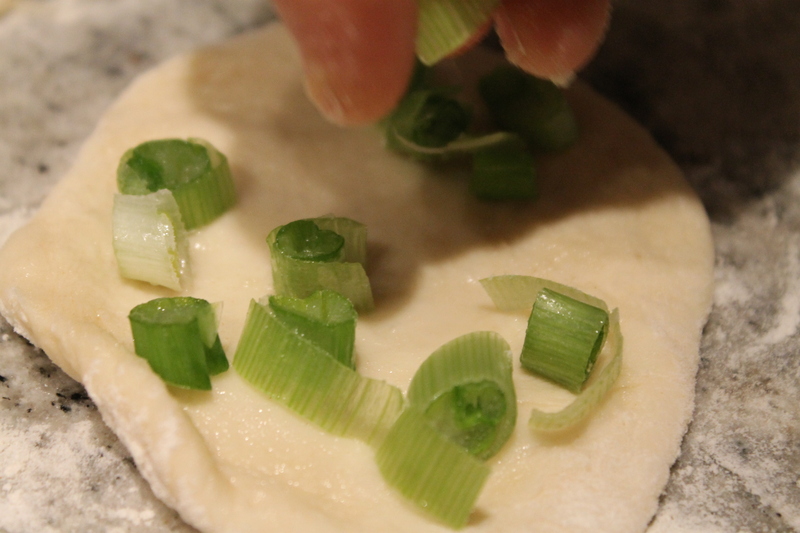 Next roll the circle up fairly tight inclosing the scallions. Once rolled into a log roll that log into a small ball. 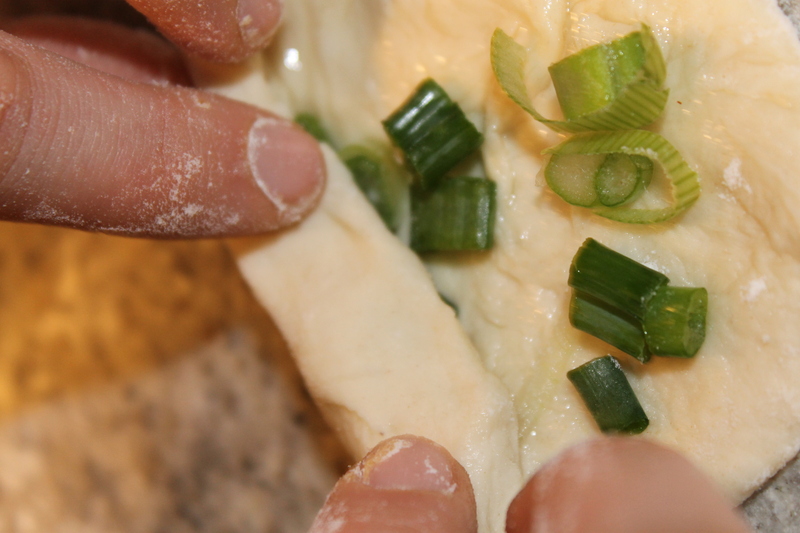 Once you have your little spiral bundle of dough and scallions squish it down with the rolling pin and roll out into a small disk – it will try and shrink on you but keep at it. Our pancakes were about 3″ in diameter. Once rolled, brush off excess flour and fry in the hot oil- about 2 minutes on each side. Scallion pancakes so light and fluffy they’re addicting! join a few, whisk, taste, repeat. And here, finally the full spread – sure it may have been 10:30pm by the time we all sat down to eat but it was well worth the effort! 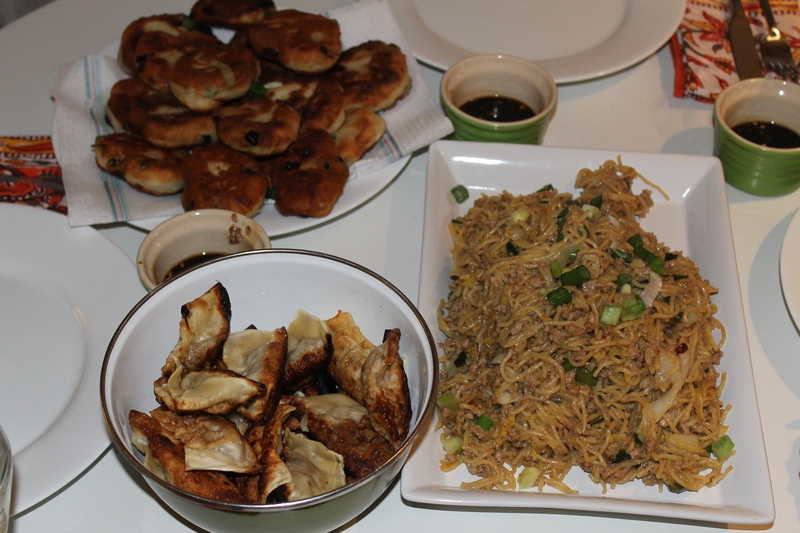 This entry was posted in Chinese, Mushrooms, Pork, Uncategorized and tagged Chinese New Year, dumplings, hoisin, mushroom, scallion pancakes, soy, udon noodles. Bookmark the permalink. Those pictures make everything look so delicious. You should hire that photographer full-time.